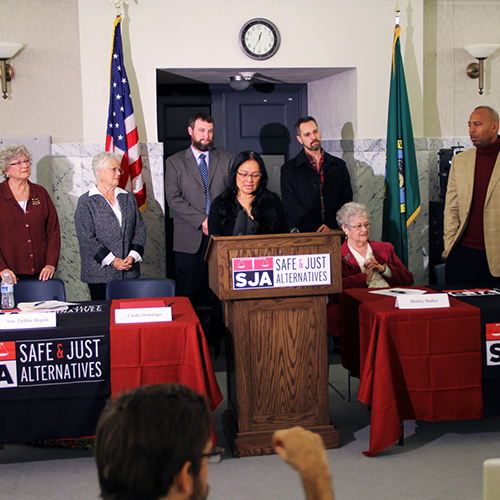 Olympia -- Senator Debbie Regala (D-Tacoma) and others who lost family members to murder urged the Legislature today to enact legislation that would repeal the state’s death penalty and replace it with life in prison with parole. They spoke at a press conference at the State Capitol. The family members of murder victims emphasized that the death penalty is a broken and costly system that fails to offer closure to victims’ families or to serve as deterrent to future crimes: “Does the death penalty bring back my family member? The answer is no. Did existence of the death penalty prevent that crime? Obviously not. And would continuing the death penalty prevent future murders? Again, the facts would indicate no,” stated Senator Regala, who is retiring from the Senate next month after representing the 27th District for the past 18 years. “Does the necessary legal process in pursuing the death penalty divert funds that could be used to focus more efforts on prevention? The answer is yes,” added Regala. Karil Klingbeil, whose sister Candy Hemming was murdered by Mitchell Rupe in 1981, said her attitudes about the death penalty have come full circle after experiencing the harm that a prolonged capital case had on her and her family. “Had Rupe received life without parole after the first trial, my family would have been spared 20 years of additional suffering. We would have been able to honor Candy’s memory and begin the healing process.” Klingbeil says that she now supports lifetime incarceration as the most severe punishment for murder.